Are you old enough to remember the bogus ads that ran back in the 70s for an over-priced little box that you plugged into an electrical outlet that "turned your entire house into a giant TV antenna"? Google, Facebook and Yahoo have been absolutely polluted recently with misleading LiveWave ads making outrageous claims. - Was developed using new technology developed at M.I.T. - That astronauts in orbit use it to watch TV. - That "new laws" passed in 2019 make it legal. - That you will receive anywhere from 600 to 800 channels (depending on which ad you see). I have been unable to get a live person on their listed phone number 855 282 8073 . Don't waste your $39.95 on this relatively useless "antenna". Cable channels always have been and always will be delivered by the cable systems through a cable to your home. Satellite TV signals are scrambled by the providers so that only their paying customers can receive them unscrambled. The only programming that can be received by any antenna are the signals broadcast by over-the-air TV stations in local market cities. Those signals can be received more effectively by $10-$20 antennas available at major retailers. With these broadcast signals mostly occupying UHF frequencies (with a few sometimes using VHF), the "bowtie antennas" and simple loops and rabbit ears that came with your TV 30-50 years ago will do a better job of getting you "free TV" than the worthless LiveWave "antenna". I am going to keep hammering on the misleading ads being used to market the LiveWave antenna SCAM until they take this crap product off the market. The implication of this ad is that a "Nobel laureate" Japanese engineer named Isamu Tanaka Ph.D wants to let you in a secret that will let you cancel your cable subscription and "Allow [you] To Watch FREE TV In HD, Get Up To 800 Premium And International Channels, Record DVR And More". Let's start with the fact that I can't find any Isamu Tanaka who is a "Nobel laureate", but I did find one who has published extensively on his career studying the effects of different substances on the lungs of rats. In an interview, Isamu Tanaka said that up until 2019, cable companies in U.S. were allowed to "scramble" their channels so that the general public could not access them without paying for their service. However, that all changed starting in 2019, with the government ruling that TV signals are public property and "belong to the people". It is absolutely true that "up until 2019, cable companies in U.S. were allowed to "scramble" their channels so that the general public could not access them without paying for their service". It is also STILL TRUE and WILL REMAIN THAT WAY. Nothing has changed. Cable TV content never has been and never will be "broadcast". When they follow up that irrelevant statement with "that all changed starting in 2019, with the government ruling that TV signals are public property and belong to the people", they want people to ignore the reality that over-the-air broadcast TV signals have always been freely available to anyone who wants to receive them. They want people to believe that plugging in a plastic disk that connects an antenna wire from your TV to the grounding wire in your house will give you free access to "Watch Any Movie, Show or TV Channel For FREE in HD" and "Get Up To 800 Premium And International Channels". Thrifty consumers who live within 30-45 miles of one or more TV stations (depending on antenna location, antenna quality, buildings and terrain typically receive about 40-50 channels in metropolitan areas and a third that many near less populated cities. These channels include the major broadcast channels plus a few networks that are specifically marketed to broadcasters for transmitting on digital sub-channels within their bandwidth allotment. Most people in my metropolitan area who use OTA signals find that somewhat more than half of the channels they receive primarily carry home shopping networks, religious programming, children's programming and infomercials. Keep in mind that those consumers are using antennas that are designed to receive TV signals as opposed to the useless piece of plastic junk that is being marketed as the LiveWave antenna. Char, ribshaw and nuk_1 like this. The LiveWave Antenna people made the mistake of opening a Facebook page. Somehow, incredulously, there is not a single positive review. Are these Livewave antenna people such rookies in the SCAM business that they have not learned the "delete button trick" yet? The follow-up comments to those LiveWave antenna reviews are well worth clicking on the LiveWave antenna Facebook page reviews link. The number of customer complaints on the review section of the LiveWave antenna Facebook page are up to 93. Not a single positive review. I wonder what luck the hapless consumers of the LiveWave antenna will have if this advertising surge on Facebook, Google and Yahoo for the worthless product ever generates enough protest to ignite a class-action lawsuit. Trying to serve papers on scammers is a huge problem with scammer's websites anonymously registered. This number showed up on my bank statement as a recurring payment for reflexology in a state 12 hours away . LiveWave antennas for sale. Step right up, folks. ^ Those are sequential screen captures of a marketing video that has been making the rounds of a huge number of Facebook pages. The superimposed assessments in red letters are added by me. "It doesn't matter if your product is a piece of junk or not. Offer a generous commission as part of an "affiliate marketing plan" and the affiliate marketers will do most of your work for you"
In just a month or two there are hundreds of Facebook webpages set up to distribute fraudulent videos and make outrageous claims about the plastic disk they're calling the LiveWave antenna. We have seen the LiveWave antenna SCAM promoters claim the endorsement of an imaginary "Japanese Nobel laureate" and an imaginary M.I.T. engineer. LiveWave antenna promoters have also hijacked the name and likeness of a reporter for the ABC affiliate in San Francisco, Michael Finney at ABC7 KGO-TV. EagleOne, Char and ribshaw like this. Whip, EagleOne, Char and 1 others like this. Do you also remember the Life Wave Patch for your: car to increase your gas mileage, Anti-Aging, Weight Loss, Energy Patch, Diabetes and ADD, and of course the obligatory cancer patch. All supposedly using nanotechnology. What a riot they were, yet hundreds of thousands of people joined and promoted them. Their website looked like it had been done by a 3rd grader on their first computer. Those were the days. Amazingly, Lifewave patches are still in existence and being actively marketed. The "internet marketing" scammers with the lc-track.com website (who may be reached by clicking on any of a large number of Facebook ads like the one above) changed the last digit of their LiveWave antenna promo page once we featured them here. It appears Facebook uses the same criteria for vetting ads that Brian Krassenstein did at Talkgold. ^ There is "Dr. Tanaka" with his "fellow engineers" introducing "the future of television" that "surpasses all limits known to science"! It's Yoshinori Ohsumi taken at that 2016 press conference honoring his winning of the Nobel Prize in medicine, again. Why doesn't Facebook have an interest in seeing that their members are not seeing ads that lead to frauds like the LiveWave antenna scammers? Soapboxmom, EagleOne and Char like this. It's simple, it is called "Advertising Revenue." for all the rhetoric from Facebook about how clever its' algorithms are, they can't / won't even recognize a blatant scam when one is pointed out to them. Remember the Omega Wand? It was promoted by Len Clements who entertained us here with his presence during that time. Seems he fell off the face of the earth. Always defended all MLM programs to the hilt and of course bragged about his 155 IQ. He was fun to play with while it lasted. I do wonder whatever happened to him. the affiliate marketers running the lc-track website promoting the LiveWave antenna SCAM have included a helpful "results locating tool". their tool lets you enter your location by zip code to "Find Out If Your Area Qualifies For Free TV & Channels You Can Get". HEYA!! 680 channels with the LiveWave antenna! WOW!! I wonder how awesome it gets in a place like New York City? Um ... 680 channels? Could something possibly be amiss with how the lc-track tool is calculating the results you will get with the LiveWave antenna? The promoters at lc-track will blatantly lie to you in any way they can dream up to try and sucker you into coughing up $39.95 for a cheap plastic disk called the LiveWave antenna that doesn't even receive as many channels as a coat hanger stuck into the antenna lead jack on the back of your TV. Has anyone informed Simon Stepsys that there is money to be made marketing worthless plastic junk now that Crypto World Evolution is going down the drain? Whip, EagleOne and ribshaw like this. It looks like the reputation managers running the LiveWave antenna Facebook page thought they had mitigated their public relations problem by removing the "reviews" page. 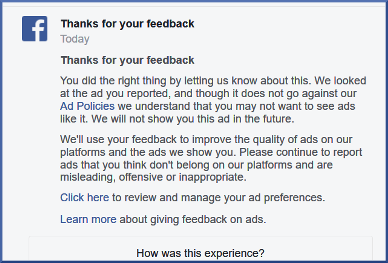 I would encourage everyone to use the "report this ad" function on their Facebook feeds. If nothing else, Facebook might get the message that people are on to their business model of making ad revenue by accepting ad business from the Livewave antenna scammers. Is there anyone from LiveWave there to remove posts or have they all taken the money and run ??? It's almost like they can't make up their minds about how consistent they want to be when it comes to deleting the onslaught of consumer complaints. There's not a single positive post on their Facebook page and while Facebook lists "242 comments", only 84 of those survive (almost all of them going up in the most recent 4 days and consisting either of "It's been months - where is my order?" or "Finally arrived - DOES NOT WORK!"). I received 23 channels - I live in the Phoenix, Arizona area. I picked up the same channels as the Clear TV Antenna. I unplugged the antenna and it still picked up the same channels. - Haven't received it yet. - LiveWave sounded too good to be true...I'll bite! - Yes, a major scam! - Buyer beware, said was shipped, wasn't. - Ordered over a month ago. Still received nothing. - Save your money...Buyer beware. - Do NOT waste your money! - This is a total scam! ^ The plethora of scammy Facebook accounts spawned to promote the Livewave antenna SCAM shows no sign of slowing down. Check out the 122 comments that follow the article. They are all complaints about or negative reviews of the LiveWave antenna. That device pictured is a bit scary. It looks like they are suggesting the your antenna csble be connected to a wall outlet, (hence the co-ax connecter on one side and US 120v plug on the other) wich is begging for blown breakers or a fire!